Strange ! 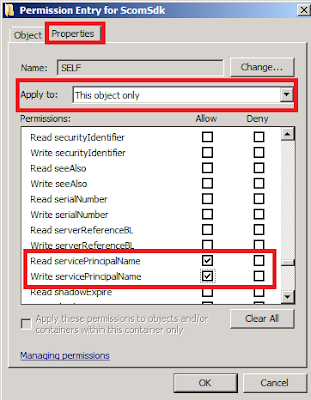 VMM 2008 R2 MP is by default available when you run "Configure Operation Manager". Why the system is asking again? Weird but here is the workaround that i use to solve this issue. Step 1:-Configure setspn and set special permission for SDK Account. b) Run ADSIEdit.msc as a domain admin. c) Find the SDK account, right click, properties. d) Select the Security tab, click Advanced. e) Click Add. Type “SELF” in the object box. Click OK.
f) Select the Properties Tab. h) Click OK three times. i) Restart your SDK service – if AD has replicated from where you made the change – all should be resolved. The best is restart DC, VMM and Operation Manager. 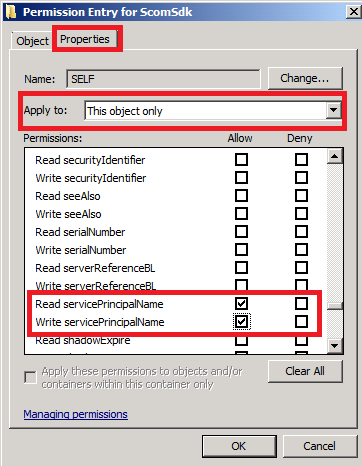 a) The Reporting URL must match between VMM and Operation Manager. To verify, on the Operation Manager Console, go to Administration > Settings > Reporting. b)You will get your Reporting URL. Enter the same URL in the VMM console. Then, try use browser and access the Reporting URL. Verify that you can access the reporting and "System Center Virtualization Report 2008 R2" is available. a) On Operation Manager Console, Click on Reporting pane, do you see System Center Virtualization Report 2008 R2? Inside this report, consist of 5 reports for Virtualization. b)If you did not see "System Center Virtualization Report 2008 R2", i advise that you perform uninstall of VMM console on the Operation Manager server. Then rerun "Configure Operation Manager" (available on VMM CD). After finish the installation, wait for a while before the report start to populating. Just keep refresh until 5 reports show up. Should I not use Local System for the SDK account? Well, it is recommended to use domain account. I've gone through these steps but it still doesn't work. SCOM2007SP1 RMS shows SPNs 2 sets, using user a/c for scom sdk svc, while the 2 VMM2008R2 servers use jst one user a/c as svc a/c and no SPNs showing, just the SCPs. Any suggestions?